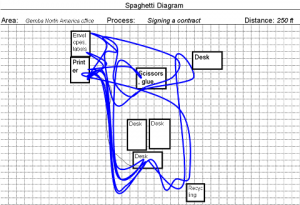 Sometimes it seems like the most difficult part of helping some companies implement lean is sorting out the various legal and purchasing details to finally get a signed contract. While the whole process can seem bureaucratic and non value added, it’s always better to spend the time upfront to have clear written agreements. Today I learned that even a simple thing like signing a contract (the part where you literally put ink on paper) can take 45 minutes. How much of that time was value added? Well, if we count only the approximately 1.5 seconds it took for me to put my signature on a piece of paper about 1.5 seconds out of 2,700 seconds, or 0.55%. Under normal conditions it should take mo more than 90 seconds to hit print, retrieve the envelope while the document prints, sign the document, stuff, seal and address the envelope and place it in the outgoing mail. Here is how to stretch 90 seconds of work to 2,700 seconds, with a little help from unforseen circumstances. I wish we had been video taping the whole incident. No, I will not reinact it. Unless of course it is on the happy occasion of signing another consulting contract. To the printing-story: our company “optimized” the printing few years ago. Before this project almost every organisation units had a printer (laser jets). Out IT decided it is very expensive (tech support, accessories, etc) and started the project with the goal “centralized printing”. Now we don’t have a printer, if we have something to print, we have to walk to another office. It is also very important to know, that now we have multifunctional machines (scanner, printer, fax), the type of the printer is set to the needs of the organisation (quantity of printed pages/year). We have a large machine (monument) that prints, copies and receives faxes. Because of these multiple functions and many moving parts, it is continually breaking down. Because people use it for all of the functions mentioned it creates waiting times and queues at the machine. Instead of right sizing with several simple machines, someone was sold the idea that this machine (monument) was better. Thank you for an interesting and I guess common list of problems encountered by many people when printing documents. My advice is first, only print documents as a last resort and only when there’s no other electronic way to communicate. Second, get a Multi Function Printer or MFP, send all your printing automatically from your PC. MFP’s can print, scan, fax, copy in one device(and make coffee, only a joke). I can recommend Ricoh’s extensive range of reliable MFP’s please contact your local dealer without delay and try one out. How many hours a year do you spend walking to that printer? There is a cost to making people walk. What if they went to an even larger “cheaper” per page printer that was 30 minutes from your desk? Would that save the company even more money? 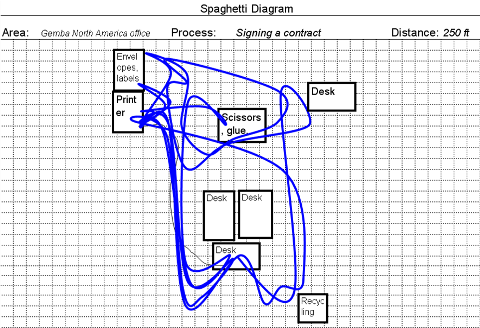 What if management required a supervisor signature before a document could be printed? That would prevent a lot of printing, and save money, but at what cost? Thanks for sharing that story, Jon. Same problem can be seen with “monument” printers in a hospital. For the “savings” generated by the centralized printers, there’s tons of walking all day long. It’s a small office and the printer is no more than 15 feet away from anyone. I spend almost no time printing documents or walking to the printer normally. That said, this whole incident is probably a good reason to evaluate our office layout again, including location of shared items. This is a great, tangible example for helping people to understand how to identify and eliminate waste. It’s something people can relate to. And I love #42, because so many people thrive on that…they live so much for that moment, that identifying standard work is difficult because then they’d have to give up the feeling of being the expert who can master the task!